The Professional Scrum FoundationsTM (PSF) course is a 2-day course that teaches Scrum by experiencing what it’s like to deliver products using the Scrum framework. Working in a series of Sprints, students break into Scrum Teams fulfilling all of the roles on a team to deliver, simulating real-life problems. The Professional Scrum MasterTM (PSM) course is a 2-day course where students learn how to use Scrum to optimize value, productivity and the total cost of product ownership. Tools are provided to enable students to relate to behavioral shifts, work with people and teams, coach and facilitate techniques, and address the organization. The Professional Scrum Master IITM (PSM II) course is a 2-day Advanced Scrum Master course designed to support experienced Scrum Masters in their professional journeys. This course is a combination of instruction and facilitated exercises looking at the challenges that Scrum Masters face and how the principles and values of Scrum help them to deal with those situations. The Professional Scrum Product OwnerTM (PSPO) course is a 2-day course on how to maximize the value of products and systems. Product Owners need to have a concrete understanding of everything that drives value from their products where students learn through instruction and team-based exercises. The Professional Scrum DeveloperTM (PSD) course is a 3-day course that teaches all members of the Development Team how to create high quality software using the Scrum framework. Working in a series of Sprints, teams of students collaborate, apply modern engineering practices, and use the Scrum framework to cope with changes. 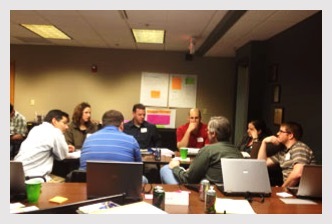 Scaled Professional ScrumTM (SPS) with Nexus is a 2-day course designed for anyone involved in building products across multiple teams to learn how they can scale product delivery with Scrum. In this workshop, students use a hands-on case study to learn about the Nexus framework and over 50 practices to reduce dependencies at scale. The Professional Agile LeadershipTM (PAL) Essentials is a 2-day hands-on workshop that uses a combination of instruction and hands-on exercises to help managers and other leaders who work directly with agile teams understand how to best support, guide, and coach their teams to improve their agile capabilities. Professional Scrum with KanbanTM (PSK) is a 2-day course that teaches Scrum practitioners how to apply Kanban practices to their work without changing Scrum. Through theory, case studies, and hands-on exercises, participants will understand the importance of transparency and flow as it pertains to the Scrum framework. Professional Scrum with User ExperienceTM (PSU) is a 2-day hands-on course where students with some Scrum experience will learn how to integrate modern UX practices into the way they are working in Scrum and how to work most effectively within Scrum Teams. Scrum.org provides the highest quality Scrum training, training materials and certified Professional Scrum TrainersTM (PSTs) to teach them all based on a set of Professional Scrum Competencies. Our training materials are created and maintained by Scrum co-creator Ken Schwaber, Scrum.org and the PST community members who teach the courses, helping to ensure that they are in tune with what’s happening in software development organizations and always up-to-date with the latest practices. Scrum.org has trained over 140,000 students around the globe. Each class includes a free attempt at the corresponding certification assessment. In your Professional Scrum class, you will learn the importance of inspection, adaptation, and fast feedback cycles. To reinforce those concepts, if you take a Scrum.org class and attempt the certification assessment within 14 days and do not score at least 85%, you will be granted a 2nd attempt at no additional cost. The assessments are decoupled from the classes and delivered in an electronic form. The decoupling of assessments from training not only ensures an objective measurement for the student, it also allows students to be assessed on their incoming knowledge and experience, and allows Scrum.org to gather feedback to fine tune training materials and their delivery. What Makes Scrum.org Training Different? Global - Scrum.org 250+ Professional Scrum Trainers are spread globally around the world. Competency Model Based - Each of the Scrum.org courses and broader role-based learning areas are based on a validated and proven competency model. Each competency has a set of Focus Areas that are used to drive an individuals learning and course material creation. View the competencies. Our Course Steward Model - Each Scrum.org course is assigned 2 stewards. The steward is ultimately responsible for collecting input on the course materials, both those that exist and potentially additions to be made, review that input with the community along with Ken Schwaber and provide updates as required. Each course is stored in GitHub, allowing version control, feedback mechanisms, distribution and much more, not unlike the code that Scrum Teams deliver for their products. Through GitHub capabilities, a PST can submit feedback on a course materials, its delivery content, speaker notes, exercises and much more. With PSTs around the world teaching the materials, that provides a fantastic number of people to provide excellent feedback to improve the content and quality of the courseware. Students of Scrum.org courses are able to claim Project Management Institute (PMI) PDU credit: 14 PDUs after attending a two-day Professional Scrum Foundations (PSF), Professional Scrum Master (PSM), Professional Scrum Master II (PSM II), Professional Scrum Product Owner (PSPO), Professional Scrum with Kanban (PSK), Professional Agile Leadership Essentials (PAL-E), or Scaled Professional Scrum (SPS) course and 21 PDUs after attending a three-day Professional Scrum Developer (PSD) course. Please note that PMI PDUs are earned for course attendance and not for passing a Scrum.org assessment. Students can claim PDUs under PMI's "Education courses provided by other third party providers” category. You can claim your PDUs online at https://ccrs.pmi.org.